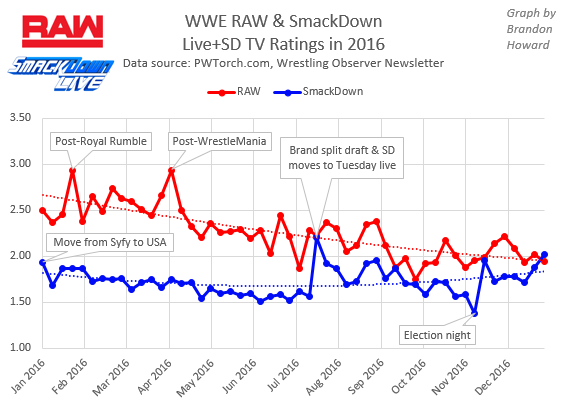 How Did RAW and SmackDown TV Ratings Compare in 2016? For the first time in many years, WWE SmackDown's television ratings are competitive with that of RAW. On the final week of 2016, SmackDown's television rating (2.02) beat RAW's rating for the prior day (1.94). That was the first time SmackDown beat RAW since 2007 when SmackDown was the higher-rated program three times that year, although two of those occasions were when RAW aired on Christmas Eve and New Years Eve. In 2005, SmackDown beat RAW three times as well. SmackDown's most competitive year versus RAW was 2002 when it beat the flagship show ten times that year. However from its debut in 1999 until 2010, SmackDown aired on broadcast television in the U.S., giving it wider coverage than RAW which has always aired on cable. Today RAW and SmackDown air on the very same cable channel, the USA Network, which makes the narrowing of the gap between the two programs more remarkable as SmackDown doesn't have the advantage of wider coverage it had in previous eras. 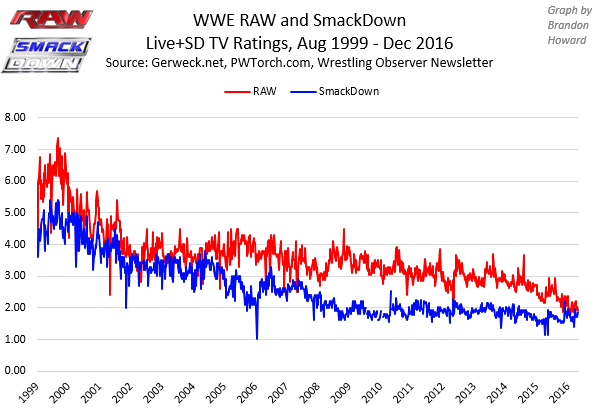 While WWE clearly isn't as hot as it was in the late 1990s, research I've done strongly suggests WWE's popularity hasn't declined in recent years as much as TV ratings data like this seem to indicate. SmackDown moved from Thursday to Tuesday night beginning with its July 19 episode last year. It also became a live show, instead of airing on a two-day tape delay in the U.S. The July 19 episode reinstituted WWE's brand split, giving each program mutually exclusive rosters. Since then RAW has been headlined by the likes of Roman Reigns, Seth Rollins, Kevin Owens and Chris Jericho. Meanwhile SmackDown has featured A.J. Styles, Dean Ambrose, The Miz and irregular appearances of John Cena. The brand split has clearly boosted SmackDown's TV ratings. RAW's viewership continues to be hindered by its three-hour run time as opposed to SmackDown's two hours. The third hour of RAW is almost always viewed less than the second hour -- one exception being when Bill Goldberg made his return to WWE in the final segment of RAW on October 17. RAW has faced stronger competition on Monday nights in the U.S. from Monday Night Football. With the NFL regular season having just ended, RAW's ratings should rebound somewhat. It'll be interesting to see whether it regains enough viewership to maintain its decisive lead as WWE's flagship program in 2017. WrestleMania Business Stats: Which Mania Was the Biggest?